If you read the Bobby Flay biography, you will note in particular, his almost instantaneous rise in the culinary world as a skilled chef. The Bobby Flay biography doesn't start with a myriad of awards and educational accomplishments. Instead, Flay worked his way up the proverbial food ladder and was consistently recognized for his natural talent. Flay dropped out of high school, and took a job making salads at Joe Allen's in New York City. His father was a partner there but it was Joe Allen that was so impressed with Flay's natural culinary talent, that he decided to pay his tuition to the French Culinary Institute. After graduating culinary school, Flay began working as a sous chef in a restaurant in New York City. He was offered the executive chef position in about a week after the head chef was fired. Bobby took the position only to quit shortly thereafter, realizing he was not ready to be an executive chef and run a kitchen entirely on his own. It was his next job, with Johnny Waxman at Bud and Jams in New York City, that would come to define his culinary career. It was Waxman that introduced Bobby Flay to the Cajun and Southwestern cooking for which he is known. Flay would later say that Waxman taught him what good food really was. From here, he began to work as an executive chef at Mesa grill and shortly after it opened in 1991 he became a full partner. Flay owns several restaurants and has built his success around southwestern cooking. His name is synonymous with grilling and his restaurants all feature his signature cuisine. The Mesa Grill in New York City was the first stepping stone towards something great for Bobby Flay. The Mesa Grill opened its doors in 1991 and since then it has become somewhat of a chain opening its doors in Las Vegas in 2004 and the Bahamas in 2007. The Mesa Grill features house made sauces and rubs over grilled food. Bar Americain is reminiscent of a European brasserie featuring the typical bold flavors for which Bobby Flay is known. There are two locations; one in New York City down the street from the Mesa Grill and the other is at Mohegan Sun in Connecticut. Not your typical steakhouse, Bobby Flay Steak in New Jersey makes a point to use New Jersey fresh produce and of course features classic Bobby Flay seasonings on its steaks. With five locations in the Northeast, Bobby's Burger Place could redefine how you think of a burger. With classic American flare, Bobby's Burger Place features burgers topped with a variety of interesting combinations. Many of the burgers on the many pay homage to a particular city featuring toppings that are local to that area From LA to Miami, Bobby's Burger Palace is synonymous with delicious gourmet burgers. While Flay's restaurants are extremely popular, he is perhaps best known for his television appearances, and cook off competitions. Because of his energetic personality and creative cooking style he has become a household name. Bobby is a "resident chef" to CBS' The Early Show. Fans of his style can tune in and get great recipes and cooking tips on everything form preparing traditional holiday fare to grilling expertly in the summer. 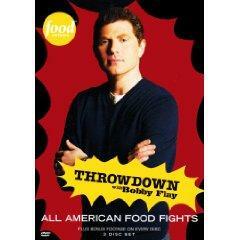 Throwdown with Bobby Flay is perhaps his best known television show and one of the most loved. The show seeks out "the best" in a particular area of food, whether it be a signature dish or a particular style of cooking. The chef thinks the he or she is going to be interviewed or featured on a FoodNetwork television show. However, Bobby Flay shows up and challenges the chef to a cook off featuring that chef's specialty that is judged by the local public. Flay typically loses but has won several throw downs as well. Grill It is another Food Network show featuring what else, but grilled foods. If you are into getting creative with your grill and finding new ways to cook the traditional summer barbecue fare, this show is for you. Another competition style cooking show, guests are chosen for their renowned mastery of grilled foods. These guest chefs are invited to cook whatever is their speciality. However, Flay doesn't know the food until the guests arrives and the show starts filming so he has to come up with his recipe on the spot. The Iron Chef is a show in which a guest chef challenges one of the resident Iron Chefs. The show has six resident Iron Chefs, all of whom specialize in different cuisines. Flay of course, specializes in Southwestern cuisine. The Iron Chef typically introduces a mystery ingredient where each chef has to create a menu including appetizer, main course and dessert that features the mystery ingredient. The food is then judged by a panel of celebrity judges. For more about Bobby Flay, you can visit his official website where you will find news on upcoming events and appearances as well as updated information on all of his restaurants. Flay also has a variety of cookbooks featuring grilled and American fare.